The STHD is an embedded strap-tie holdown offering high loads and a staggered nail pattern to help minimize splitting. The STHD incorporates many features that aid correct installation and improve performance. When installed on the forms with the StrapMate® strap holder, the unique design of the STHD delivers enhanced stability before and during the pour to help prevent both parallel and perpendicular movement (relative to the form). This results in accurate positioning of the strap and reduced possibility of spalling. See General Notes for Holdowns and Tension Ties. Use tables for both standard concrete and post-tension slab installations. Install before concrete pour with a StrapMate, or other holding device. Nail strap from the bottom up. Install strap plumb. Strap may be bent one full cycle (bent horizontal 90° then bent vertical) to aid wall placement, but may cause spalling behind the strap. If the spall is 1" or less, measured from the embedment line to the bottom of the spall, full loads apply. 1" to 4" spalls for LSTHD8 achieve 0.9 times table loads. STHD10 and STHD14 achieve full load for spalls less than 4". Any portion of the strap left exposed should be protected against corrosion. Other than where noted in the two-pour detail, do not install where: (a)	A horizontal cold joint exists within the embedment depth between the slab and foundation wall or footing beneath, unless provisions are made to transfer the load, or the slab is designed to resist the load imposed by the anchor; or (b)	Slabs are poured over concrete block foundation walls. Additional studs attached to the shearwall studs or post may be required by the Designer for wall sheathing nailing. Wood shrinkage after strap installation across horizontal members may cause strap to buckle outward. For installations in severe corrosion environments, refer to General Corrosion Risks for additional considerations. See installation illustrations in the image gallery for rebar information. Simpson Strong-Tie® STHD holdowns with Method PFH Wall Bracing on 4-inch Wide Concrete Garage Curb. 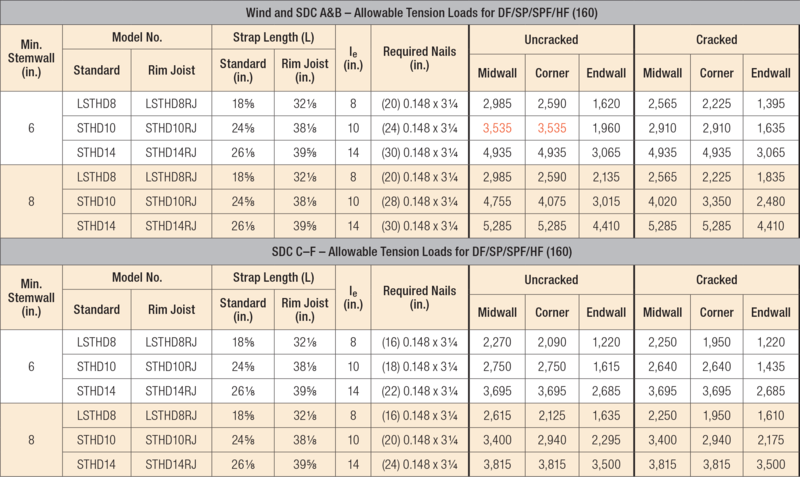 0.148" x 3" or 0.148" x 2 1/2" nails may be used as a direct replacement for the required nails shown in the table with no load reduction when they are installed directly over framing or over 1/2" maximum structural sheathing. Use the number of nails listed in the table or as otherwise specified. In many cases, not all nail holes will be filled. Nail strap from the bottom up. Deflection at the highest allowable loads for installations over wood double studs is as follows: Installed on framing: LSTHD8 = 0.089", STHD10 = 0.117", and STHD14 = 0.118". Installed over 1/2" maximum structural sheathing: LSTHD8 = 0.114", STHD10 = 0.146", and STHD14 = 0.164". Per 2012, 2015 and 2018 IBC, Section 1613.1, detached one- and two-family dwellings in Seismic Design Category (SDC) C may use "Wind and SDC A&B" allowable loads. Minimum center-to-center spacing is three times the required embedment, 3 x le, for STHD strap-tie holdowns acting in tension simultaneously. Midwall installation is based on 1.5 x le end distance. See technical bulletin T-C-SCLCLM for installation on structural composite lumber posts or columns. For brick ledge applications, use full loads shown for STHD14 installed in 8" stem wall. Fasteners: Nail dimensions in the table are listed diameter by length. See other nail sizes and information. LSTHD See specific model numbers for code listings. STHD See specific model numbers for code listings.